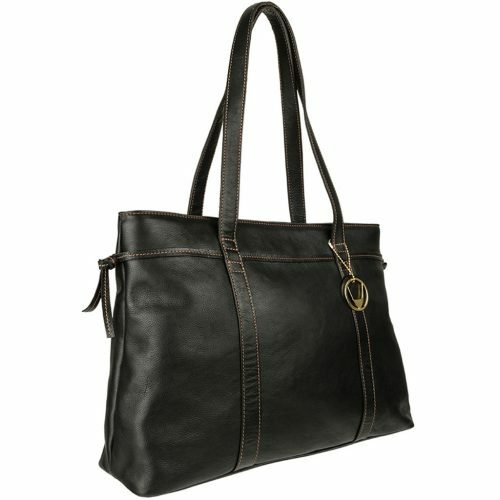 A beautifully elegant woman’s tote or work bag made in natural vegetable tanned top grain leather. The bag is classic and functional, and perfect to carry a tablet or small iPad along with other office necessities. A hanging brass bull’s head Hidesign logo with a leather background adds a touch of contemporary design detail to this otherwise subtle bag that emphasizes beautiful leather. Lining: Red cotton for the brown bag and blue cotton for the black bag. Handles & Strap: Two leather handheld shoulder straps with a 10″” drop length. Interior Details: A large middle divider and zip compartment. One additional small zip pocket and slip pocket.